"I’ve seen them headline End Of The Road Festival in 2012 but never somewhere like this,” a fan tells me as we’re queuing to get in to the 375 capacity Hackney venue, Oslo, to see Grandaddy’s first London show in four years. Predictably, the tickets to see these genius indie rock orchestrators, who are as timeless as Sparklehorse and Daniel Johnston, sold out in an instant. This occasion is so much more than about seeing one of the best bands of all time in a ridiculously small venue, though. It’s about celebrating a more sustained Grandaddy return. Their 2012 reunion following their 2006 split was fleeting and solely nostalgic. This show tonight though is a precursor to bigger new album shows as they’re poised to release to put out their first LP in ten years. And it also marks the release of their brand new 7”. Many who get in the gig tonight do so because they walked down to Rough Trade and bought a ticket over the counter and got a copy of it for free. The eruption of noise from the crowd as singer Jason Lytle takes to the stage indicates just how pleased everyone here is to have the band back. They say absence makes the heart grow fonder and at some points many of these lifelong Grandaddy fans will have thought they would never see them live again ever - hence the hysteria. Famously, Lytle was burned out by the nomadic rock and roll lifestyle after 14 years in Grandaddy and opted for a more primal existence in the Montana mountains for years. To the singer’s credit, though, his step back from touring with Grandaddy has ensured the optimum conditions for his creativity to thrive, and has resulted in a band that now, rather than going through the motions, appear to be on top form. “It sounds amazing out here,” shouts one member of the audience. “That helps, it really does…. It’s just hard to get into it up here,” responds Lytle. Although flawless he is self-conscious and not having the best time with his poor monitor sound. This continual strive for perfection about the little things is a healthy attitude, though. It feeds into everything he does as a musician. There’s an impressive level of detail in the way the keys, drums, and guitars band are orchestrated. 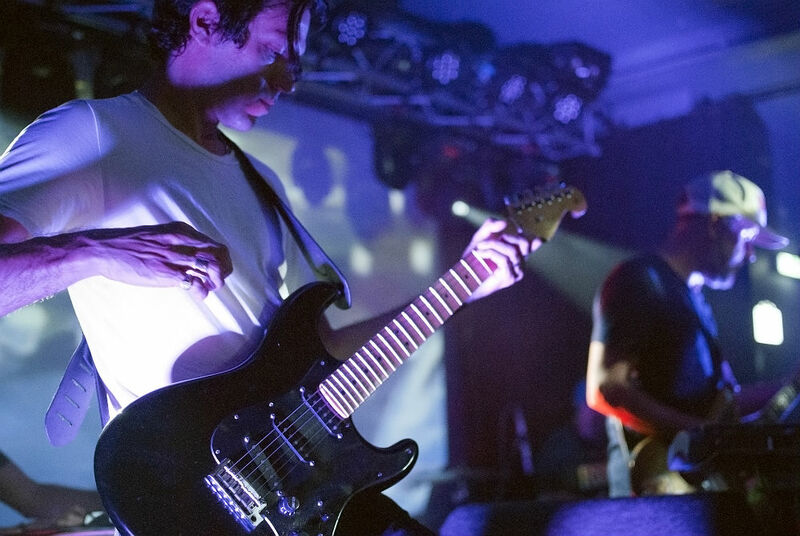 Lead guitarist Jim Fairchild, also of Modest Mouse, has an especially clever way of self producing live, ensuring the dynamics of his instrument and tones compliment the feel of the song. Their set list is a crowd pleasing one. They play the new ones, a couple of b-sides, but draw predominantly from their three most critically acclaimed albums: The Sophtware Slump, Sumday, and Under The Western Freeway. Only ‘Disconnecty’ from their fatigued 2006 album, ‘Justy Like The Fambly Cat’, makes the cut. The audience enthusiasm reaches a raucous peak during ‘Crystal Lake’, which is one of the greatest indie pop songs ever written. Nearly everyone in the room sings to the chorus as the trippy synth sci-fi synth part whirls around. ‘Now It’s On’ is another standout in a set of standouts. The lyrics in the chorus: Bust the lock off the front door. Once you’re outside you won’t want to hide anymore, are biographical and about trying to disconnect from modernity and embrace nature. Meaningful music with a sublime melody is always a pleasure to hear. The first of the two new songs to get a live airing is ‘Chek Injin’, which has a decisively hard hitting drum part throughout and gets people jumping. The other new cut, ‘Way We Want’, is introduced with a humorous self-deprecating manner as Lytle says: “Now to bring the mood down here’s another new one.” Obviously it goes down a storm and hints at the next Grandaddy album being as mesmeric as their best stuff. I’ve never witnessed appreciation as sincere and heartfelt as the audience give tonight and it’s a wonderful thing to be a part of. Such is the benefit of attending an intimate gig after the show the band are hanging out having a few beers. They seem in good spirits and happily sign the single for a few people but mostly are able to relax as and enjoy London. Luckily we won’t have to wait four years for their next return.